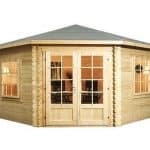 The 5m x 5m Haven Log Cabin is a stylish garden building, designed as a chalet-style log cabin that could be used for multiple purposes. 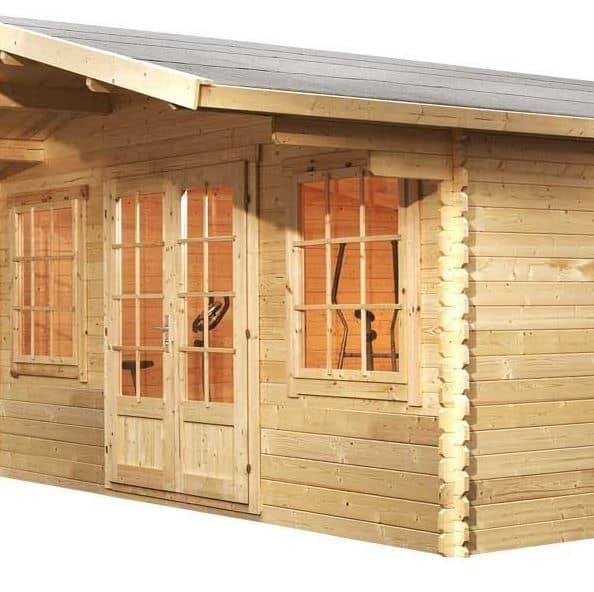 With a large 16’ x 16’ interior and external overhanging roof, the log cabin is perfect for all seasons and can be used to enjoy the garden all year round. 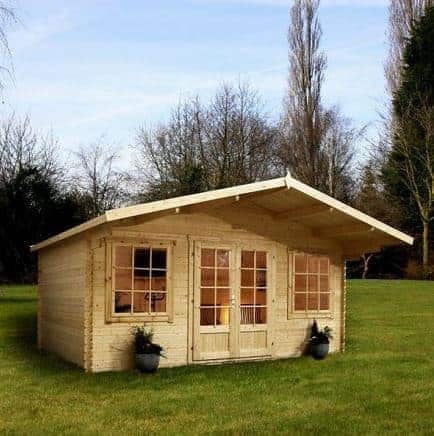 A 16’ x 16’ log cabin that has an impressive overhanging roof, allowing for shade and protection from the elements, the roof also offers a lovely traditional feel. The Baltic pine that is used to make the structure is slow grown, which means you have strength and quality here that will stand the test of time. The structure also benefits from a felt roof that prevents rainwater from becoming an issue. The floor, walls and ceiling have a tongue and groove structure that prevents rot. All of this is backed up by a 10-year anti-rot guarantee by the manufacturer. The large windows and glazed double doors provide excellent views out to the garden, and make the log cabin suitable for use all year round. Security issues are not a problem with a lock and key for the doors, giving you the peace of mind that any items store inside are safe and secure. 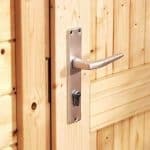 In this section we have a look in further detail at the different features that the Haven Log Cabin has to offer. We understand that when making a big purchase such as this it is important that all of your requirements are met and the cabin will fit into your lifestyle to be enjoyed for many years to come. Exterior: The Haven Log Cabin certainly lives up to its name in offering a wonderful garden retreat that will blend effortlessly into your garden thanks to the natural timber exterior. The 34mm tongue and groove timber comes with a 10-year anti-rot guarantee, ensuring the building is both durable and long-lasting. The fantastic over-hanging roof is a feature that allows shelter from the elements, as well as the sun during the warmer months. It is ideally placed to allow items such as plant pots or chairs to be placed in front of the summer house whilst being protected in a sheltered position. Interior: The stunning 16’x16’ interior has the same tongue and groove wall panels and flooring, as displayed externally. The warm-toned timber provides a cosy feel to the interior, as well as providing a blank canvas for you to style your dream garden room. With ample space for furniture, as well as hobby equipment, the log cabin could be used for a multitude of purposes, from a general summer house to a hobby room or home office. Doors & Windows: Two large, multi-paned windows and a set of double doors are placed to the front of the log cabin, allowing light to fill the interior. The windows are fully functional, working on a hinge mechanism and the doors may be completely opened during the warmer months to allow fresh air in and wonderful views out to the garden. Double glazing and single glazing options are available during the purchase process. Security: The Haven comes complete with a lock and key for the double doors, providing adequate security for a garden setting. 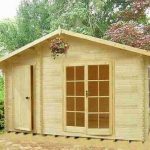 The large windows and glazed doors do provide a view of the contents from the outside, however, if this is an issue then you may consider a shed alarm (available to purchase separately). 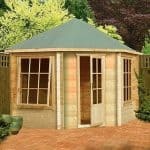 5m x 5m Haven Log Cabin: How easy to build? 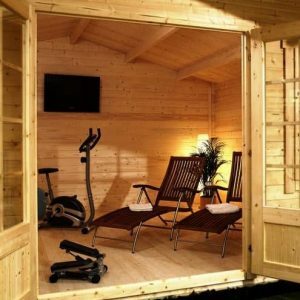 It would easy to be overwhelmed at the mere thought of putting together the Haven Log Cabin, however do not be discouraged; assembly is made as straight-forward as possible, even for those with limited DIY experience. Everything needed for an easy assembly will be provided in your package, including timber panels, roofing, glazing, fixtures and fittings. A comprehensive instruction manual is included, providing step-by-step instructions and easy-to-follow diagrams to keep you on the right track. With a two-person assembly it is expected that the process will take a full day. 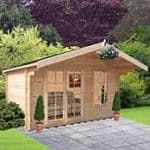 5m x 5m Haven Log Cabin: What is the overall quality like? Tongue and groove cladding is used throughout the building, on the wall panels, roof and flooring. The interlocking timber panels give the structure sturdiness and durability that is necessary for a building of this size. 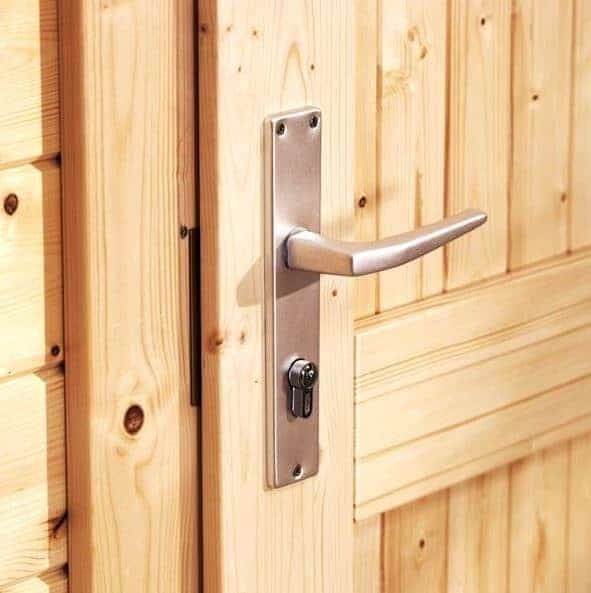 A 10-year anti-rot guarantee is provided by the manufacturer to show their confidence within the product and giving you peace of mind that the log cabin will be serving a practical purpose for many years to come. Heavy-duty mineral felt is used to cover the tongue and groove cladding on the roof to make it both waterproof and protected from the elements. The windows come fitted with 4mm single glazing as standard, however other glazing options (double and single) may be chosen during the purchase process. 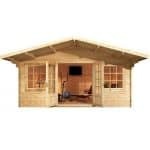 The 5m x 5m Haven Log Cabin is a dream building for the larger garden able to accommodate its large 16’x16’ size. With a traditional timber log cabin aesthetic combined with modern fixtures and fittings, the log cabin will offer a fantastic space for the whole family to enjoy. 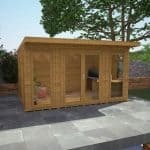 This wonderful garden building uses high quality construction and design to justify its higher price tag, providing the potential purchaser with the confidence to choose the Haven cabin as their new garden getaway.